What would happen if you didn’t care for your teeth? Dental check ups x-rays, cleanings… Do you get a “yuck mouth” image in your mind? You know, kind of like those Saturday afternoon monsters with the nasty teeth and breath? The same thing can happen to your pet if it does not get regular dental care. 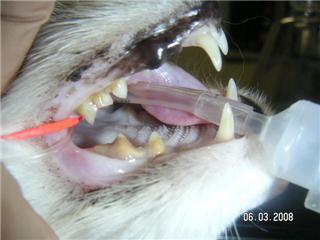 Periodontal Disease is the most common disease in dogs and cats! ** They have the bad breath, yellow-brown teeth, and pain! Yes, your pet feels the pain of a sore tooth just as you might. This pain may cause them to even stop eating. Infections of the gums and tooth decay can spread to the heart, liver, lungs and kidneys where it can do more damage! Daily brushing is the best way to maintain good dental health in your pet (and you too) ! 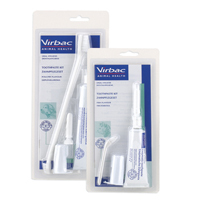 Pet Toothbrushes and Pet Toothpaste (chicken flavored) that can be used for both cats and dogs. This is a special toothpaste that is meant to be swallowed – unlike the toothpaste we use for our own dental hygiene. 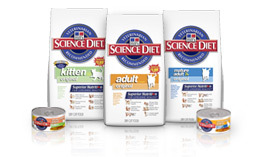 Hard foods are excellent also, as long as the kibble is the right size for your pet. If the kibble is too small it might lodge in between your pets teeth – and since most of our pets do not floss that one kibble could be the start of tooth decay. 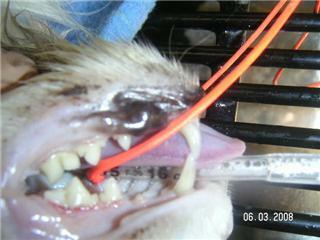 Our pets DO get gingivitis – 85% of adult pets have some form of periodontal disease. It is important to have dental cleanings one or two times a year to help prolong the life of your beloved family member.